Teaching our little ones to pray at an early age is a wonderful way to encourage a lifelong relationship with God. When my son was just an infant, I tried to incorporate a prayer routine with him. Of course during that time, he didn't really know what I was doing, but my hope was that it would stick with him as he gets older. Lately, he's been getting a good idea of what praying is. He has even started to fold his hands while we begin praying. Of course he's still a bouncy toddler, so it's a work in progress, but it pleases me to no end that he is starting to catch on. Having a few good children's books on praying also does help quite a bit. He can see that it's not just mommy and him who pray, but all of the cute characters in those books, too. Recently we've added a new one to his prayer book collection, The Berenstain Bears Book of Prayers. This new prayer book for toddlers features Mama and Papa Bear, Brother, Sister, and Honey. Nearly 50 simple rhyming prayers cover a typical day and the typical worries of a young child. From waking in the morning to going to sleep at night, from thanking God for a meal to praying for His comfort when afraid, the prayers will help little ones see that any moment is a good moment to talk to God. With its soft padded cover and convenient size, the book is the perfect way to teach children about prayer and the ways God cares for us each day. If you haven't already noticed, we can't get enough of that lovable, wholesome bear family. I enjoyed reading their books when I was a little girl and now my son enjoys them, too. The Berenstain Bears Book of Prayers is a thick padded board book, so it's absolutely perfect for his age. He can flip through the sturdy pages–looking at the fun colorful illustrations that not only include the bear family, but a collection of animals and various nature backdrops. Help and Guidance: To help conquer anger, sickness, fear, etc. Each prayer is short and sweet with fun rhyming text that's fun to read. The topics included are perfect for toddlers and preschoolers, because they can easily relate them to their own lives. Hello, day, and goodbye, night! Thank you, Lord, for morning's light. Please help me to be brave, dear Lord. I know you're always here. so there's no need to fear! I close my eyes and pray. When it comes to praying, it's especially nice to teach children at an early age, so they can grow into a habit of talking to God as they get older. 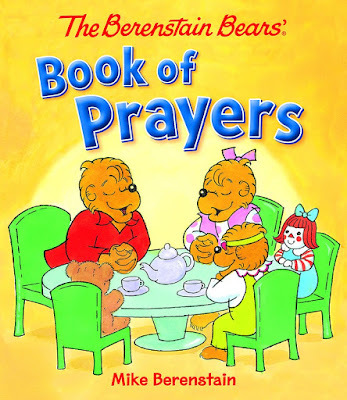 Reading The Berenstain Bears Book of Prayers is a precious way to help them get started on their journey to becoming little prayer warriors.